Multipotent neural progenitor cells (NPCs) generate the major cell types of the central nervous system (CNS): neurons, astrocytes and oligodendrocytes. Human pluripotent stem cells (hPSCs), including embryonic stem (ES) cells and induced pluripotent stem (iPS) cells, can be directed to differentiate into NPCs using a variety of methods. This process, known as ‘neural induction’, must be efficient and reliable, in order to generate high-quality NPCs for downstream applications. hPSC-derived NPCs are used extensively for studying human nervous system development, modeling neurological disorders and screening potential therapeutic molecules. STEMdiff™ Neural Induction Medium is a defined, serum-free medium for the generation of NPCs from hPSCs. 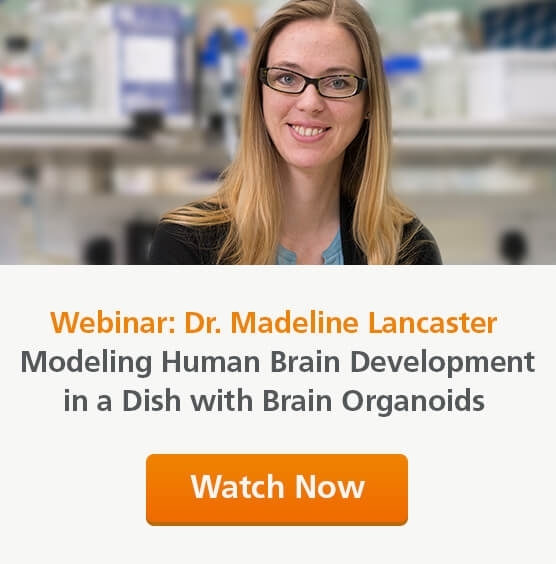 The standard protocol for this product involves EB formation and selection of neural rosettes, to obtain highly enriched cultures of CNS-type NPCs in 12 days (Figures 1A, 2A). In this technical bulletin, we describe a method for neural induction using STEMdiff™ Neural Induction Medium in a monolayer culture system (Figures 1B, 2B). Using this protocol, CNS-type NPCs can be generated from human ES or iPS cells in six to nine days. (A) The embryoid body (EB) protocol for neural induction using STEMdiff™ Neural Induction Medium involves EB formation, using AggreWell™800 plates, and neural rosette selection, using STEMdiff™ Neural Rosette Selection Reagent. (B) In the monolayer culture protocol, single cell hPSCs are resuspended in STEMdiff™ Neural Induction Medium and cultured as a monolayer. 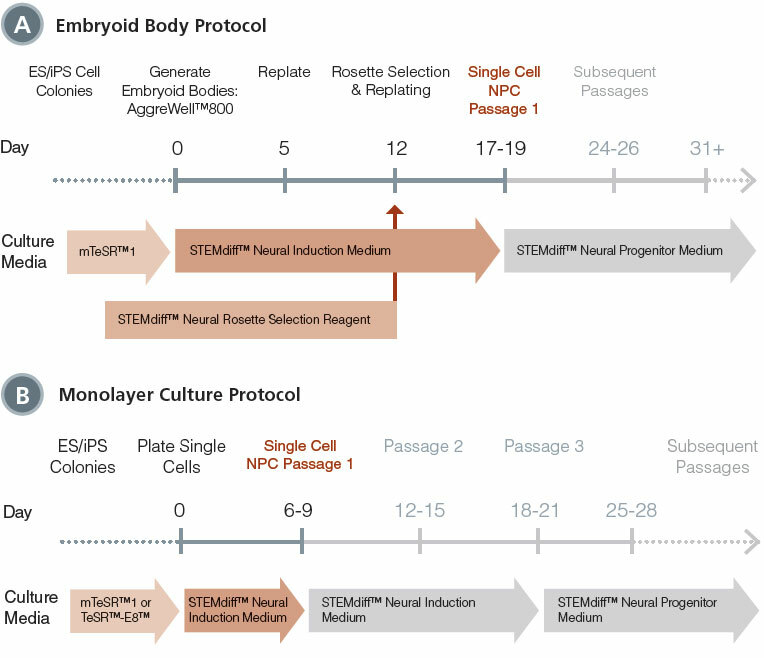 Following neural induction using either protocol, NPCs are expanded using STEMdiff™ Neural Progenitor Medium. (A) At day 12 in the EB neural induction protocol, distinct clusters of neural rosettes are clearly visible and can be isolated using STEMdiff™ Neural Rosette Selection Reagent. (B) NPCs in the monolayer culture protocol form a more morphologically homogenous confluent monolayer. Although rosette-like radial arrangements of cells may be observed (see higher magnification in inset), these are not sufficiently morphologically distinct to allow rosette isolation. Scale bar = 100 μm. STEMdiff™ Neural Induction Medium can be used for neural induction in a monolayer culture system, to generate highly enriched cultures of PAX6-positive NPCs. The confluent NPC monolayer generated using this method may feature rosette-like radial arrangements of cells, but the morphology is not sufficiently distinct to allow for neural rosette isolation (Figure 2). The time-course of neural induction is similar in the EB and monolayer culture procedures (Figure 3); however, the time-points at which NPCs are available as single cells differ. In the EB protocol, PAX6-positive single cells are available for passage at day 16-18, after rosette selection and replating (Figure 1A). In contrast, in the monolayer protocol, PAX6-positive single cells are available for passage at day 6-9, as soon as neural induction is complete (Figure 1B). Human ES cells (H9 cell line), previously maintained in mTeSR™1, were subjected to neural induction using STEMdiff™ Neural Induction Medium and either the EB (A-C) or monolayer culture (D-F) protocol. Cultures were processed for immunocytochemistry at the time-points indicated to detect PAX6 (red) and OCT4 (green) expression, and assessed by visual inspection. (A) At day three of the EB-based protocol, 40 - 50 % of the cells are PAX6+, indicating neural induction. (D) At day three of the monolayer protocol, 30 – 40 % of cells are PAX6+, but many cells still express OCT4, a marker of undifferentiated cells. (B, E) At day 6, the majority of cells are PAX6+/OCT4-, in either protocol. (C, F) At day eight, all cells are PAX6+/ OCT4-. Scale bar = 50 μm; A-F taken at same magnification. Immunocytochemistry and quantitative PCR data show that during neural induction of ES cells, OCT4 expression decreases rapidly in the first 3 - 4 days, after which PAX6 expression increases (Figures 4 - 5). 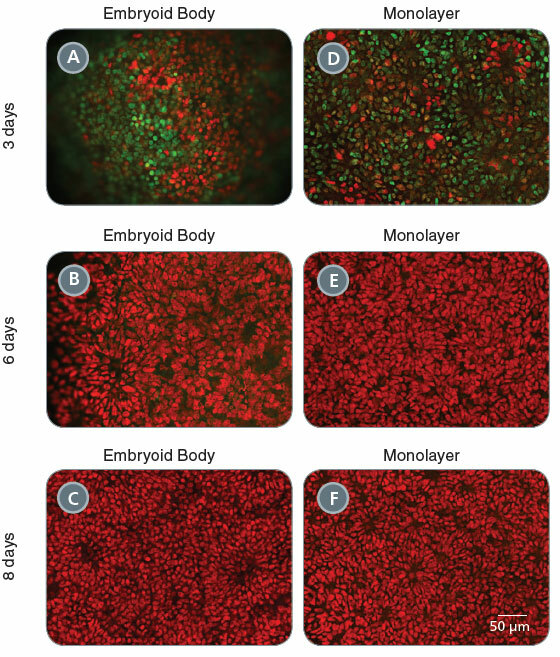 This monolayer culture protocol can also be used for neural induction of human iPS cell lines, although the time-course of induction may be slightly longer. In addition, highly efficient neural induction of human ES and iPS cells can be achieved, regardless of whether they were previously maintained in mTeSR™1 or TeSR™-E8™ (data not shown). Human ES cells (H9 cell line), previously maintained in mTeSR™1, were subjected to neural induction using the monolayer culture method. (A-B) At day one, the majority of cells are OCT4+ (green). (C-F) The number of PAX6+ (red) cells gradually increased and by day three, approximately 30% of the cells are PAX6+. (G-H) At day four, the majority of cells are PAX6+ and only a few OCT4+ cells can be detected. (I-J) By day 5, there are no remaining OCT4+ cells and all the cells are PAX6+. Phase contrast images show representative cell confluence at the time-points indicated. Quantitative PCR data from H9 cells reveals that PAX6 expression (red) is very low at day 1 and increases as neural induction proceeds. PAX6 expression spikes sharply after day 4 and continues to rise on day 5 and 6. In contrast, OCT4 expression (red) is high on day 1 and decreases rapidly thereafter. The key distinguishing features of the EB and monolayer culture protocols are summarized in Table 1. Here we describe a procedure for neural induction using STEMdiff™ Neural Induction Medium in a monolayer culture-based system. Using this method, PAX6-positive NPCs can be generated efficiently. This simple protocol can be used to achieve rapid and efficient neural induction of ES or iPS cells maintained in either mTeSR™1 or TeSR™-E8™. For a complete list of related products, including specialized cell culture and storage media, supplements, antibodies, cytokines and small molecules, visit www.stemcell.com/hPSCNCworkflow or contact us at techsupport@stemcell.com. This procedure is for neural induction of ES or iPS cells cultured in 10 cm2 culture dishes. If using alternative culture-ware, adjust volumes accordingly. This protocol was developed using H9 human ES cells and has been validated with the ES and iPS lines listed in Table 1. It may be necessary to modify some steps of the protocol, such as seeding density (step 12) or timing of first passage (step 14), to optimize performance for other cell lines. Poly-Ornithine/Laminin- or Matrigel®-coated plates or coverslips (see STEMdiff™ Neural Induction Medium manual; Catalog #28782). Pre-warm STEMdiff™ Neural Induction Medium, Gentle Cell Dissociation Reagent, PBS without Ca2+ and Mg2+, and DMEM/F-12 to 37°C. Estimate volume of STEMdiff™ Neural Induction Medium required for initial seeding (see Table 2), and supplement with 10 μM Y-27632 (ROCK inhibitor). Inspect each 10 cm2 plate of human ES or iPS cells (previously maintained in mTeSR™1 or TeSR™-E8™) and aspirate any areas of differentiated cells. Rinse each plate once with 5 - 10 mL of sterile PBS. Add 3 mL of Gentle Cell Dissociation Reagent and incubate at 37°C for 8 - 10 minutes. After incubation period, gently dislodge cells that are still attached, using a 5 mL pipet. Triturate cells by pipetting up and down 5 - 10 times. Add 5 mL of DMEM/F-12 and collect cells into a 50 mL conical tube. Optional: Add an additional 5 mL of DMEM/F-12 onto the 10 cm2 plate to rinse off any remaining cells and add to the 50 mL tube. Count viable cells e.g. using Trypan Blue and a hemacytometer. Centrifuge cells at 300 x g for 10 minutes. Resuspend cells in an appropriate volume of STEMdiff™ Neural Induction Medium supplemented with 10 μM Y-27632 to achieve a seeding density of 200,000 or 250,000 cells/cm2, for ES cells and iPS cells respectively. See suggested volumes in Table 2. Seed cells onto poly-Ornithine/Laminin- or Matrigel®-coated plates or coverslips. Replace medium daily with fresh STEMdiff™ Neural Induction Medium. Y-27632 is not required after seeding. If performing further differentiation to neuronal lineage, see Important Notes below. After six to nine days in STEMdiff™ Neural Induction Medium, cells will be OCT4-negative and PAX6-positive (Figures 3 - 5). At this point, cultures will be confluent and ready for passage using ACCUTASE™. After the first passage, NPCs should be passaged once they reach 70 - 80% confluency, and seeded in the next passage at a density between 125,000 and 200,000 cells/cm3. Maintain NPCs in STEMdiff™ Neural Induction Medium until passage 3. 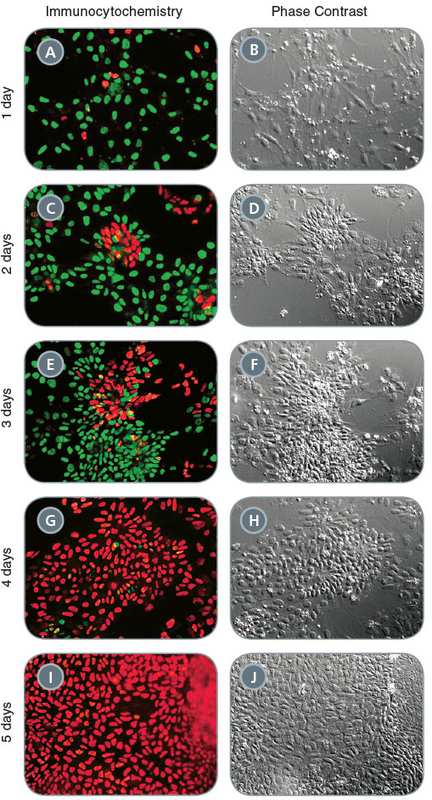 At passage 3, transition cells into STEMdiff™ Neural Progenitor Medium. Supplement STEMdiff™ Neural Induction Medium with Y-27632 for the first day after each passage. Y-27632 is not required when maintaining cells in STEMdiff™ Neural Progenitor Medium. Visual inspection of cultures is not a reliable method of confirming neural induction. We recommend assessing expression of markers for neural induction (PAX6) and/or undifferentiated ES or iPS cells (e.g. OCT4). We recommend maintaining NPCs in STEMdiff™ Neural Induction Medium until passage three, and in STEMdiff™ Neural Progenitor Medium thereafter. STEMdiff™ Neural Induction Medium should be supplemented with Y-27632 for the first day after each Y-27632 is not required when maintaining cells in STEMdiff™ Neural Progenitor Medium.